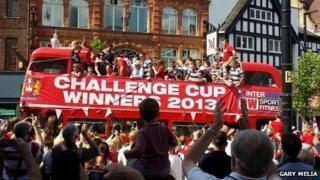 Thousands of people have lined the streets of Wigan for an open-top bus parade through the town to celebrate Wigan Warriors' Challenge Cup win. The rugby league team showed off the Challenge Cup to cheering fans as the bus made its way from Standishgate to Market Place. The rugby league team followed up Wigan Athletic's Wembley win in May with a 16-0 victory against Hull on Saturday. It is the 19th time the Warriors have lifted the Challenge Cup. The town is believed to be the first place in the country to win both the Challenge Cup and football's FA Cup in the same year. Wigan Warriors captain Sean O'Loughlin said the double was a "special" achievement.